Kadhi is basically a gravy made up of buttermilk and chickpea flour and is prepared in various ways across regions.The famous Punjabi version 'Kadhi Pakora' is a thick version and the pakoras(onion or methi fritters) are dunked in the thick kadhi.The Gujaratis make their kadhi very thin and also mildly sweet.While I like both the versions I make them according to my preferences. I make kadhi quite often and it appears at least once a week in my menu,it pairs well with rice/roti/khichidi.I rarely make Pakora waale kadhi because of the deep frying involved and it is boring to eat the plain kadhi sometimes.Hence I try to do variations with some roasted vegetables like Ladies finger or raw banana,sauteed spinach,curd chillies,gatte(chickpea flour dumplings),sun dried urad dal fritters etc.I also play with various seasonings of kadhi which makes it taste different each time.I have mentioned a few variations in the notes,please go through if you want to give a try. Steam raw banana for 7-8 mins or pressure cook for 1-2 whistles,it should be firm to touch.Once it is cooled down,remove the skin and cut into 1/2 inch half moon pieces. Heat oil in a thick kadai and add raw banana pieces and fry them on high flame for 2-3 mins with out mixing it. Reduce the flame and turn the pieces and fry on low-medium flame until they are crisp.Remove them and keep aside. Whisk chickpea flour,turmeric powder with sour curd and mix well.Add 1 1/2 cups water and mix well with out any lumps and keep it aside. Heat ghee in the same pan and crackle cumin seeds.Add fenugreek seeds ,broken red chillies, asafoetida,red chili powder and fry for few seconds. Add whisked chickpea flour-curd mixture and mix well and cover it and cook on low flame for 12-15 mins.Cook well until you see the mixture bubbling and form a nice thick kadhi.Check the consistency,I prefer a slightly runny kadhi instead of very thick or very thin. Add grated ginger,salt,coriander leaves to kadhi and cook for 2-3 mins. Add fried raw banana pieces and mix well and cook for a minute and remove from flame. 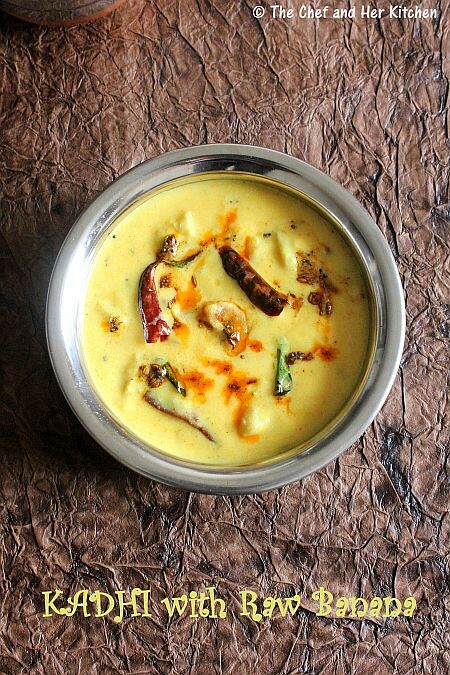 In a separate small pan heat ghee and crackle mustard seeds followed by broken red chillies,curry leaves,asafoetida and fry for few seconds and pour this tadka over kadhi. Serve it hot with rice/khichdi/roti/paratha. You can follow the same procedure for kadhi and instead you can add sauteed spinach for Palak Kadhi or deep fried okra pieces for Okra Kadhi or Onion pakora or methi pakora for Kadhi Pakora for a variation. 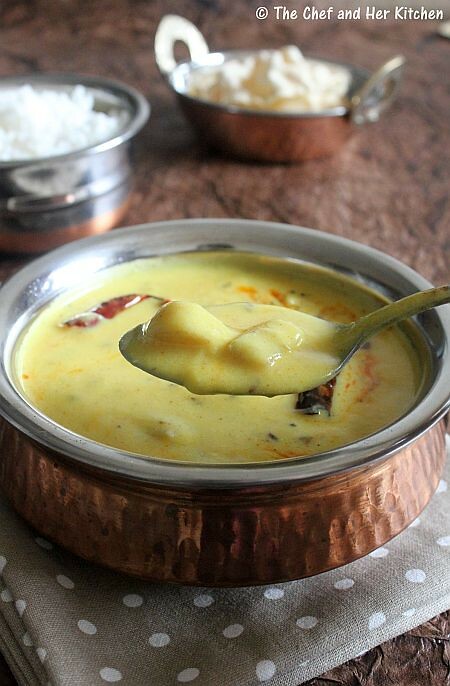 You can add few pinches of saunf or ajwain in tempering before starting making kadhi.It gives a nice flavor to kadhi. Whole masalas like 2-3 cloves,1" cinnamon can be added to the tempering before making kadhi.This makes the kadhi more aromatic and I prefer to add them when I am making it for any occasion as I avoid whole spices in my cooking on daily basis. 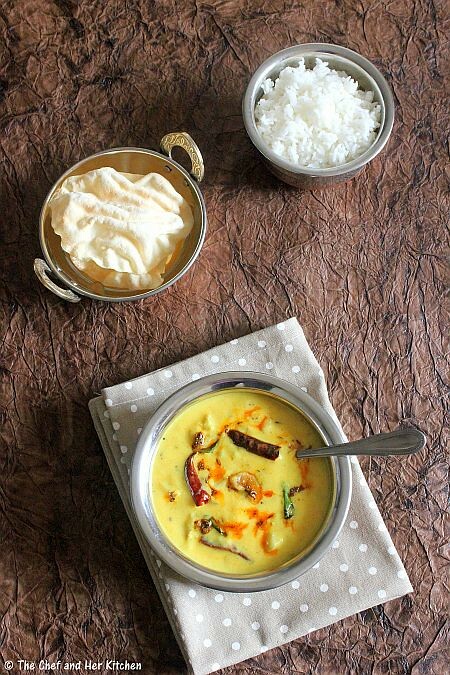 that looks really yummy..would love it with jeera rice..
Kadhi looks delicious...Had kadhi from restaurant never attempted making it..Loved that cute kadhai...Lovely clicks..
Kele ki kadhi looks so tempting. It's beautiful! 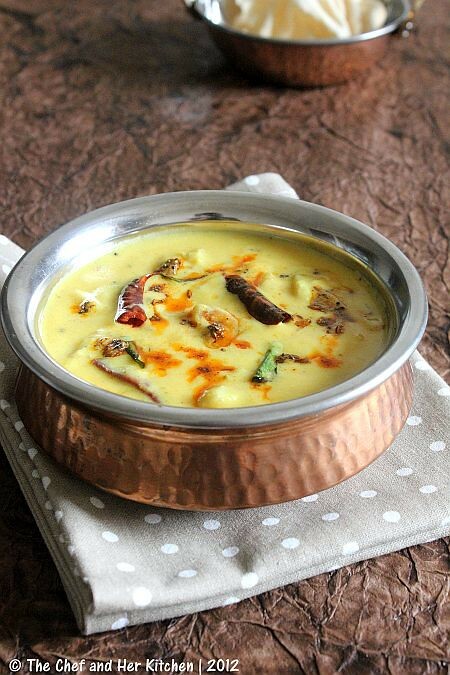 A nice twist to the traditional recipe of Kadhi. delicious and so smooth..loved this version of curry..nice clicks! South Indian style majjige huli with pakoras is a favorite! 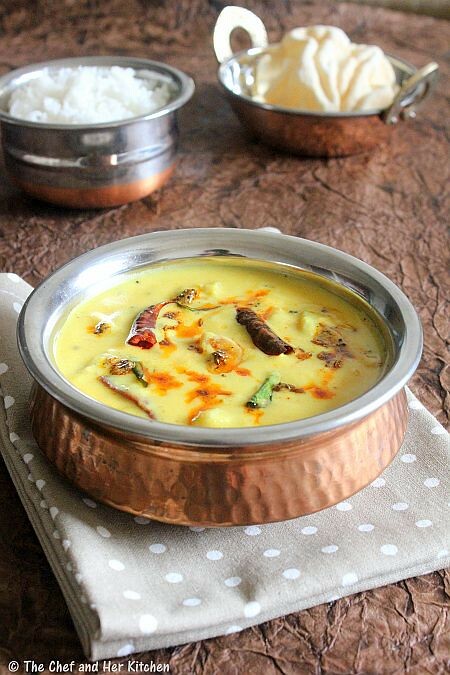 I must try your kadhi, will make great meal for the weekend! Khadi is my favorite too, especially with kichchidi / ven pongal. Nicely presented. very inviting! Lovely colour, beautifully presented...looks creamy and yummy. Thatz new to me, i know of only Kadhi pakora:-) Loved this variation! 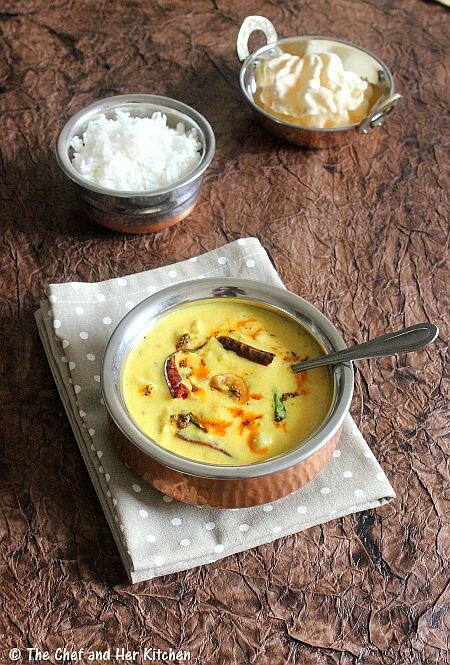 Wonderful looking irresistible Kadhi, lovely spread. Looks so creamy, my comfort food. Never made it with raw banana though. I don't feel like buying the raw bananas for the past few months here, they turn mushy within a day :-(, will wait to get some good ones. 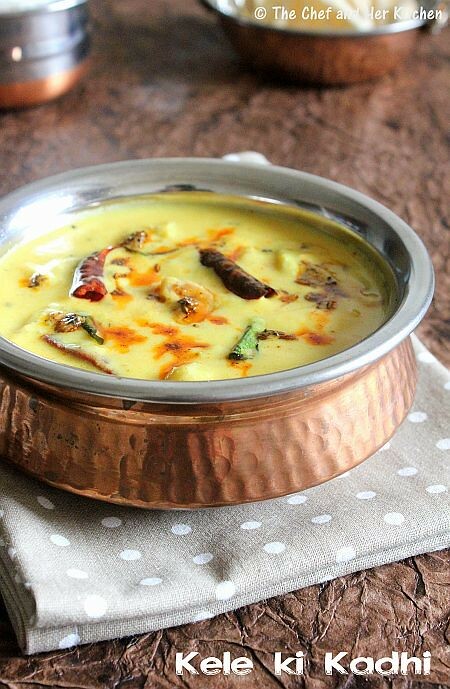 you make kadhi with so many variations. you have given me so many ideas. i always make kadhi plain or with pakoras.